how can you win without teenwolf(f)? the 237 football fans in the united states are all crying their eyes out after yesterday’s embarrassing loss to the czech republic. it was probably the worst performance so far in this year’s world cup. but while many fans are crying, i’m just mad (which makes me cry sometimes, but it’s different). the reason the usa lost wasn’t because they thought their number five ranking in the world entitles them to more respect (read: overconfident) or because they played without any urgency or energy. no, they lost because they didn’t use their best weapon: josh wolff. josh wolff may be the world’s most dangerous football player. 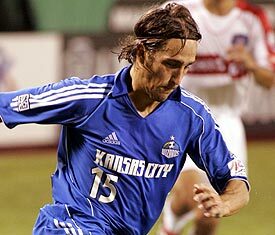 i saw him once last year at a real salt lake game (he plays for kansas city) and he dominated the game. he has this ability to just turn on a switch and up his game; one minute he’s a normal football player, the next moment he’s a monster weaving through defense and scoring (or assisting) goals. at first i didn’t understand this incredible power. then, a couple months ago, i was flipping through the television stations on a saturday afternoon and came across the answer. one of the channels was playing a movie featuring a young micheal j fox (before he died). the movie: teenwolf. in teenwolf, micheal fox’s character turned from a sub-par basketball player to an allstar whenever he changed into a werewolf. similarly josh wolff switches from an average player into an allstar almost at will. and his last name is wolff. obviously teenwolf is a movie based on josh wolff but the producers switched the sport to basketball and added a physical change (human to werewolf) since they thought a story about a football player wouldn’t sell well in the usa. watch for josh wolff in the next game. and when you see him suddenly up his game, just know that he’s teenwolf(f)in’. is it just me or does the guy in that picture look like matthew mcconaughey(the colored photo, not the teenwolf[f] one [although you could probably make a strong argument])? no way. josh wolff is good-looking.